Cristiano Ronaldo has arrived in Turin as he prepares to begin life at Juventus with pre-season training starting for him on Monday. The Portuguese superstar was afforded additional time off this summer after his exploits at the World Cup in Russia, while the Serie A champions confirmed their €100m+ swoop for the former Real Madrid superstar earlier this month, as per their official statement. 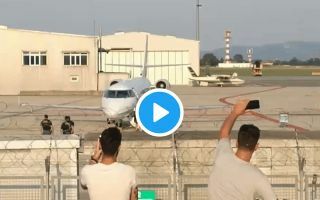 As he prepares to embark on a new chapter in his career, Ronaldo has arrived in Turin with his family, as seen in the video below, and he’ll be expected to report for pre-season training on Monday. The majority of the Juventus squad is currently out on their pre-season tour in the US, and so the 33-year-old won’t get to immediately work with many of them. Nevertheless, Paulo Dybala, Gonzalo Higuain, Juan Cuadrado, Douglas Costa and Rodrigo Bentancur aren’t with the squad either and so there will be a star-studded group in Turin this week working on their fitness ahead of the new campaign. After such a glittering, trophy-laden spell in Madrid, time will tell if Ronaldo can help deliver similar success to Juventus as they look to sustain their domestic dominance while also targeting the Champions League. Ronaldo will undoubtedly be seen as the catalyst to end their wait for European glory.